Northern Ireland retailers have said they feel under siege and are asking if they will be next to fall victim of the recent spate of ATM thefts as police appeal to the public to be their "eyes and ears" in their crusade to put an end to the robberies. The PSNI has established a special task force of detectives to investigate the incidents and have upped patrols at "vulnerable and high risk" locations. There are concerns among retail groups ATM providers could decide to remove machines from rural areas, potentially leaving communities without access to a cash machine in their area. One shop owner took the extreme step of surrounding his machine in concrete in a bid to prevent it being stolen. Retail NI, which represents independent retailers, met with police on Thursday. Chief executive Glyn Roberts described it as productive saying they appreciated police efforts to catch those responsible. "I feel reassured that the PSNI is stepping up their investigations and the number of patrols," he said. "Our members are being ruthlessly targeted by these criminal gangs and feel under a state of siege. As we approach the weekend Retail NI members are asking themselves will they be next. 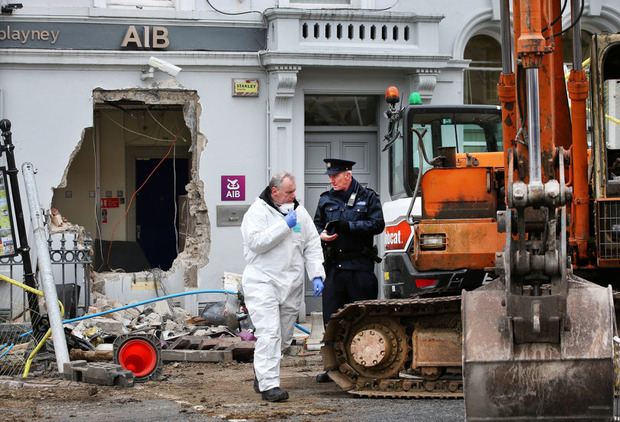 “Retail NI is urging the general public to report anything suspicious around building sites or retailers with ATM’s. If they see a digger moving in their town or village in the middle of the night, ring 999. "No small business owner should ever have to face such a threat. We are urging the community as a whole to be vigilant and to stand with our members in these challenging times. Police appealed to communities across Northern Ireland to be wary of heavy plant machinery operating late and night or very early in the mornings. "It is not possible for our officers to be everywhere at once and to predict where these criminal may target next. We need communities to help be our eyes and ears," said Detective Chief Inspector David Henderson. “As the weekend approaches, I want to reiterate our appeal to people across Northern Ireland to remain vigilant and alert to any activity that is unusual, out of the ordinary or suspicious, especially the movement of plant machinery late at night or early in the morning. The key to stopping these crimes and getting ahead of the criminals is you, the public. “Recent attacks on ATMs are impacting our communities on multiple levels. The livelihoods of our local businesses are being jeopardised by the thefts and they are forced to face the additional costs involved in repairing their premises. "The populations served by the ATMs, which are often rural, are being denied access to cash facilities. Farmers and construction firms are suffering the loss of expensive equipment and machinery, a loss from which some will struggle to recover." Detective Chief Inspector Henderson added: "If you see activity overnight in or around building sites, report it immediately. Owners of plant machinery, please secure and lock up your equipment, and please consider installing immobilisers - at least one digger theft has recently been prevented because of one. "Business owners, please review your security. Consider installing alarm-linked motion sensor cameras if you don’t already have them."